Plan ahead for your next Hawaii Vacation or find out what's happening today. Basic Ocean Safety Tips. Important information for Hawaii visitors and residents. Vog impacts people who are sensitive to volcano produced air pollutants. People on the Big Island have a history of striving to push beyond beliefs and limits whether it is training for the Iron Man Triatholan, envisioning world class resorts built on top of lava flows, or designing water catchment systems and other off-grid independent energy systems. 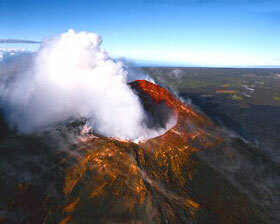 It takes something special to coexist with an active volcano. The Big Island really is big, with many niche ecosystems and unique towns. Take some time to explore Big Island Health Guide Directory to appreciate the multi-faceted health and wellness offerings here. Check out Big Island Health Talk when you are wondering what to pack for an evening hike across the lava fields, how to protect the reef when snorkeling or how to behave around a pod of wild dolphin. The Big Island Health Guide Directory can also help you locate medical facilities, massage therapists, unique accomodations, kayak rentals, and provide a safety guide to hiking and ocean sports activities.